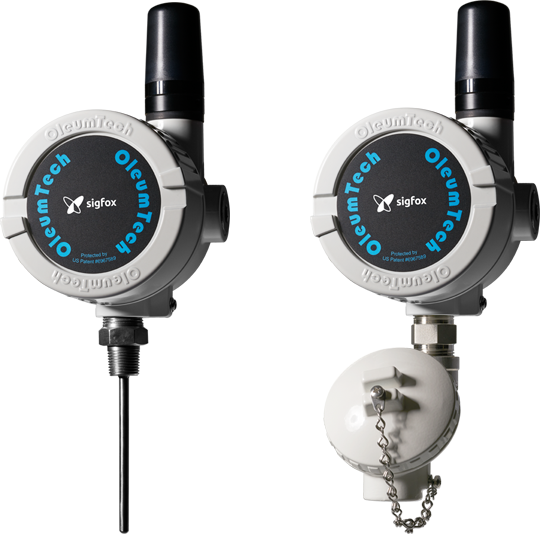 The OleumTech® Sigfox Ready SFX-RT51 and SFX-RT52 Wireless RTD Temperature Transmitters are designed for deployment anywhere in the world that Sigfox has network coverage. By leveraging the Sigfox Low Power Wide Area (LPWA) network, you can take advantage of the world’s leading Internet of Things (IoT) connectivity service, offering a software-based communications solution where all the network and computing complexity is managed in the Sigfox CLOUD™. The SFX-RT51 and SFX-RT52 sensor nodes are certified for use in Class I, Division 1 (Zone 0) hazardous locations. They are intrinsically safe, designed not to cause a spark, and can be serviced without being removed from a process. The SFX-RT51 is a direct mount type that is available with a 4-wire Platinum 100 ohm RTD sensor. The SFX-RT52 is designed to support a third-party RTD sensor: 2, 3, or 4-wire type.